That was using pyserial, connecting directly from PC to Arduino via COM17. Those instructions are parsed and executed on the Arduino. The numbers tell how much the joystick was deflected. But it wasn’t very interesting to connect directly from PC to robot via Bluetooth. I wanted to strap my smartphone on to add that extra layer of sensors and computing power. So my scheme was for my PC to talk to my smartphone and for the smartphone to be like the Jewel Wasp, controlling the robot via Bluetooth. print "Android phone failed to link to robo's Bluetooth"
print "\nPlease connect a joystick and run again.\n"
print "Depress trigger (button 0) to quit.\n"
The main changes were to handle commands sent via Bluetooth. Bytes were read one at a time and accumulated into a buffer. The buffer was parsed for commands and the commands were executed. I had to tune the vectors a little to take advantage of the analog joystick input and to smooth out transitions to/from any direction. 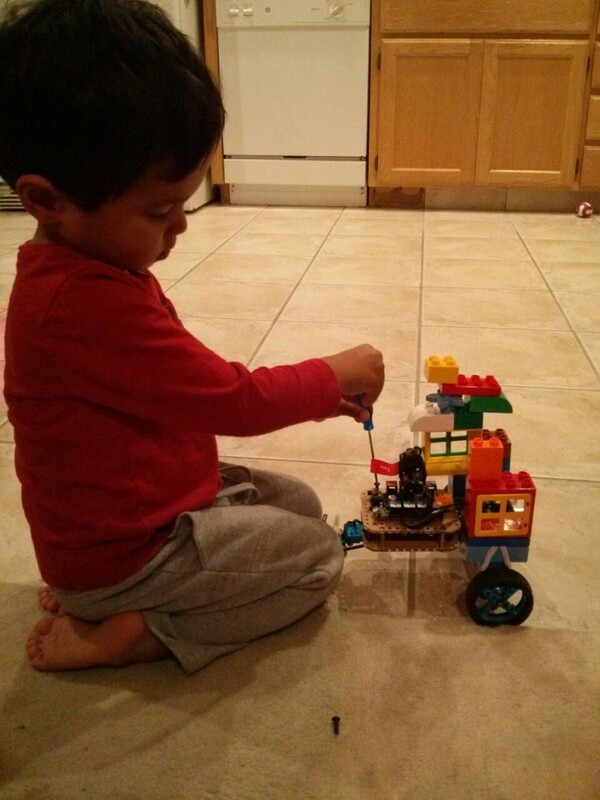 I rigged the smartphone onto the robot with Legos. Then I downloaded and streamed the robot’s POV using the “IP Webcam” app because why not? It worked better than I expected. The controller lag was not too bad, even with the inefficient command string processing scheme. When I was done playing I restored it back to the old IR + Ultrasonic setup. I still haven’t figured out what’s the best next step from IR to Bluetooth for a kid. LG Optimus Dynamic – perfect cellbot phone? It is the cheapest, full-featured Android phone that I’ve found. Only $20 on Amazon NEW. It feels like finding hidden treasure because the only reason it’s so cheap is that the phone is targeted for the bottom market. And, normal people who buy the phone later add minutes to use it as a phone. But not us! If everyone did what we want to do with the phone, they’d lose money because there’s no way this package can be produced and sold for a profit at $20. So shhhh… let’s just keep this between you and me. (optional) Root it. That link takes you to a super simple one-click script and all you need is a PC and the USB cable that came with the phone. I don’t know why I rooted mine, but it’s Android and you can, so why not? You could install this custom ROM too if you want (I didn’t). And if you screw something up like I did, you always go back to “stock” with this. Install SL4A — the Scripting Layer for Android. This lets you interface with Android and everything your phone’s hardware allows… from a Python script. Notice the “import android” above. That’s from here. Download android.py and put it next to hello.py above. The hardware isn’t great and it’s still on Gingerbread, but I’m pretty sure it’s still more powerful than NASA’s Lunar Lander. It’s just a steal at $20 for the nice package. Battery life is super and everything works fine. It even has an external micro SD slot! Oh one thing you might want to upgrade for our example above is the Text-to-Speech voice. Gingerbread is old so you don’t get Google’s latest TTS software. So I downloaded IVONA. It’s free, it works for Gingerbread and I like Amy’s UK English voice. By the way, the SL4A website taught me that I’m not the first brilliant person to think of using smartphones for robots. And, the term for robots that use smartphones is Cellbots. But it still makes me wonder why people still want to mess with things like a $30 XBee WiFi module. Especially when phones like the Optimus Dynamic gives you WiFi (plus everything else) for $20. Who knows. We made an interesting discovery: mama’s fuzzy bunny slippers are invisible to the ultrasonic sensor. I tried to demonstrate why by bouncing some balls off different surfaces. But I’m not sure if you got it. Bao has been taking a break. I think having a robot that moves on its own stresses you out. You’ve been running to flip the off switch after playing with Bao a little. Maybe it’s too much for a 3 year old to deal with. On the plus side, now you know the deal with batteries and recharging, and how Bao gets slow when he’s low on energy. The “energy” and “battery” concept is handy for explaining why you have to eat and sleep. This is a $20 prepaid smartphone. Prepaid meaning you can actually buy minutes to use it as a smartphone (e.g. if you need a spare phone for family visiting from out of town). And this one’s nice because it has “triple minutes” for life. So you can buy 200 minutes and the phone will give you 600 minutes magically. But what I’m really buying this for is the hardware and software. It comes packed with the usual sensors: GPS, accelerometer, compass, light sensor; and communication interfaces: Bluetooth, WiFi, PLUS a camera, video recorder, audio recorder, a 1GHz processor, some RAM and 4GB of storage space, AND whatever apps you want and the Android OS to tie it all together. All for $20! In the robot world, each of these devices would cost $20 or more by themselves. But thanks to the economics of smartphones, you can get them ALL for $20. What a wonderful time we live in. I really feel that smartphone tech will accelerate many more industries. (Example: Oculus Rift.) So instead of buying loosey goosey electronics for your robo, the only thing you need is Bluetooth… to pair with a smartphone. One thing we might have to do soon is give Bao a bumper. The ultrasonic sensor takes a beating from all the crashes. Anyway, with the new 3-wheel configuration, we haven’t had to recharge it for 3 days. The 4-wheel tank ran empty in just one day. But then again, we’ve only been in IR mode. Maybe the Ultrasonic processing is a power hog too. What’s that sound coming from downstairs? Bonus: The mailman brought gifts! An 8-pack of Eneloops and one fast charger. I got that charger because it has a DC 12V input, which can be driven by cigarette lighter sockets and a foldable solar panel I’ve been thinking of getting. I was impressed with how quickly you understood its algorithm. Later, I got excited when the CR2025 batteries came in the mail for the IR remote. So we upgraded Bao with IR control. You were a terrible pilot at first, and as you can see, we found out why when you ran away in the middle of playing. I was starting to wonder if we really wanted the tank mode. The tracks kept getting stuck, it ate too much power, it was heavier, and it wasn’t efficient (2 wheels driving 4 wheels, slack in the tracks, etc). The 3-wheeled car was starting to look like a better design. It’s simple like a FWD car, with each motor driving one wheel directly. So we converted Bao to a 3-wheeler tonight and you renamed him to Bawa. Its name is now Bow (as in Bow-wow). And it’s a girl. Batteries are still charging. Meanwhile, I showed you the code and the instruction “Forward”. We’re learning how to “teach” the robot how to do things by sending it instructions. The first thing we’ll do is show it how to go forward. You said, “And then we’ll teach it to spin.” Good idea. Then I was thinking of teaching it how to use its “eyes” so it spins when you put your hand in front of it. Then maybe we’ll load the ultrasonic obstacle-avoidance program. Update: Somehow I kept tinkering until 5am without batteries, but with the board attached to my computer. I couldn’t move the motors, but I could simulate it by printing to the SoftwareSerial. I added a “handbrake” mode so it pulls the handbrake if it’s stuck or if it gets bored. Then, to start it again, you first have to turn it so it’s no longer facing any obstacle. Then, give it the “Go” signal by waving in front of its eyes. * Copyright (C) 2013 Maker Works Technology Co., Ltd. All right reserved. The plastic rivets in the kit were a pain. Too small for my fingers. I fumbled for a long time and it wasn’t something you could help with. Finally it was time to put on the eyes. Then you tried connecting the batteries to the brains. Beep! The Arduino IDE upload to the robot failed with a stk500_getsync error. We really wanted to turn it on. But it was getting late because we went trick-or-treating. So we had to save it for tomorrow. Update: while you were asleep I figured out that I was following old instructions and using and old driver. The Makeblock websites were probably outdated in a few places. E.g., the old one said to select Arduino Uno. 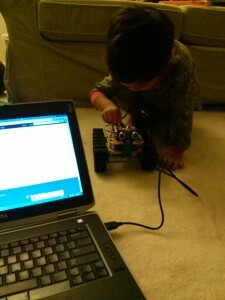 But what worked was using the Arduino Leonardo driver and choosing Arduino Leonardo as the board in the IDE. I uploaded the “Blink” test and the blue blinking LED was glorious. Then I tested the DC motors. One track spun the wrong way so I reversed the wires. Now both tracks spun forward with the Forward instruction as they should. The motors were wimpy because it looks like the batteries didn’t come pre-charged. So pop them in the charger, and I spent some time “child-proofing” the structure for j. A few twist-ties helped secure the brain bucket from tugging and snatching. We are ready for tomorrow. I didn’t want to introduce all these extra complications for you tomorrow; I wasn’t sure if I would lose your attention. But maybe I’m not giving you enough credit and I should have?